The DfT has announced this morning that the West Coast Franchise has been awarded to First West Coast Ltd.
Stagecoach Group plc ("Stagecoach") is disappointed that its joint venture, Virgin Rail Group, has been unsuccessful in its bid for the new West Coast rail franchise, due to commence in December 2012. · Last year, the franchise had the highest customer satisfaction of any long distance operator. We believe that Virgin Rail Group submitted a strong bid for the new franchise, which offered the prospects of continued, high quality services for passengers and a substantial yet deliverable benefit to taxpayers. Stagecoach and its joint venture partner, Virgin, were both committed to Virgin Rail Group winning the new franchise but only on terms that resulted in an acceptable risk-reward profile and which would add value to the partners' shareholders. We understand that Virgin Rail Group was the Department for Transport's ("DfT") second choice bidder and that the reason it failed to secure the new franchise was because another bidder contracted to pay significantly higher premium payments to the DfT. · The requirement for a parent company guarantee of certain additional responsibilities being transferred to the train operator in respect of stations. 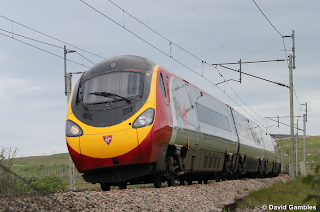 · Annual cost savings of £45 million (before taking account of inflation and additional costs to support the revenue growth initiatives contained in the bid), including through building on Virgin Rail Group's key relationship with Alstom, with whom VRG had agreed contractual terms, and further enhancing the supply chain. · Initial capital at risk of £105 million, reflecting an initial performance bond of £45 million (which would increase over the franchise term in line with inflation), an initial season ticket bond of £5 million (which would increase over the franchise term as season ticket revenues grew), an initial guaranteed shareholder loan commitment of £40 million and a parent company guarantee of stations obligations of £15 million. While Stagecoach recognises that the revenue growth assumed in Virgin Rail Group's bid was ambitious, Virgin Rail Group had the advantage of being the incumbent operator meaning that: (i) given its knowledge of the franchise and access to management, it was able to validate and test its revenue-enhancing initiatives, (ii) it had access to established, Virgin Rail Group owned revenue and yield management systems and (iii) it would have been able to commence initiatives well before the commencement of the new franchise and without the added challenges of managing the transition from a different train operator. Stagecoach is shortlisted to bid for the Greater Western and Thameslink rail franchises. Stagecoach continues to progress its bids for these franchises and in addition, it will consider other franchise opportunities as these arise. In addition, Stagecoach continues to develop various other opportunities for further growth as we explained in more detail in our preliminary results for the year ended 30 April 2012 announced on 26 June 2012, and the outlook for the Group remains positive.
" Virgin Rail Group has revolutionised train travel on the West Coast Main Line. I am bitterly disappointed that Virgin Rail Group has been unsuccessful in its bid for the new West Coast rail franchise. After 15 years, it is difficult to imagine a West Coast rail service without the Virgin brand. I would like to thank all those that have been involved in delivering the Virgin vision over that time and all those that contributed to the strong bid for the new franchise. The outcome is a blow to all of those people. Stagecoach will now continue to assess other franchise opportunities and, where appropriate, will work in conjunction with its Virgin partner."